A new international review of mercury in freshwater and marine food webs helps explain why many top predators in the Arctic have high mercury concentrations. The review found that the increase in mercury from prey to predators, biomagnification, is greatest at high latitudes, such as the Arctic. This means as predators ingest prey or other plants, they take with them the concentration of Hg and other toxins. While that is good news for warm, tropical regions, colder regions remain vulnerable even if inputs from the atmosphere are low. 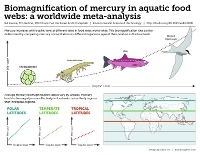 This meta-analysis, published in the online edition of Environmental Science and Technology (http://pubs.acs.org/doi/abs/10.1021/es403103t), used mercury data from 205 aquatic food webs around the world and has uncovered important global trends in how mercury is transferred through diverse aquatic food webs. Link to high resolution JPEG. Humans have altered the natural cycling of the toxic metal mercury, with coal combustion and gold mining accounting for the majority of atmospheric emissions, during the past 150 years. Biomagnification of Hg through aquatic food webs results in Hg concentrations in predator species which can be millions of times higher than those observed in surface waters. Biomagnification of Hg can lead to toxic concentrations in fish, fish-eating wildlife and humans. “This is important for ecosystem risk assessment and mercury pollution monitoring, especially for the highly vulnerable Arctic regions where mercury is biomagnifying more effectively, says Dr. Linda Campbell, associate professor of environmental science at Saint Mary’s University and one of the co-authors of the report. The risk of elevated mercury concentrations in fish to human and wildlife health is well known with government advisories issued worldwide. 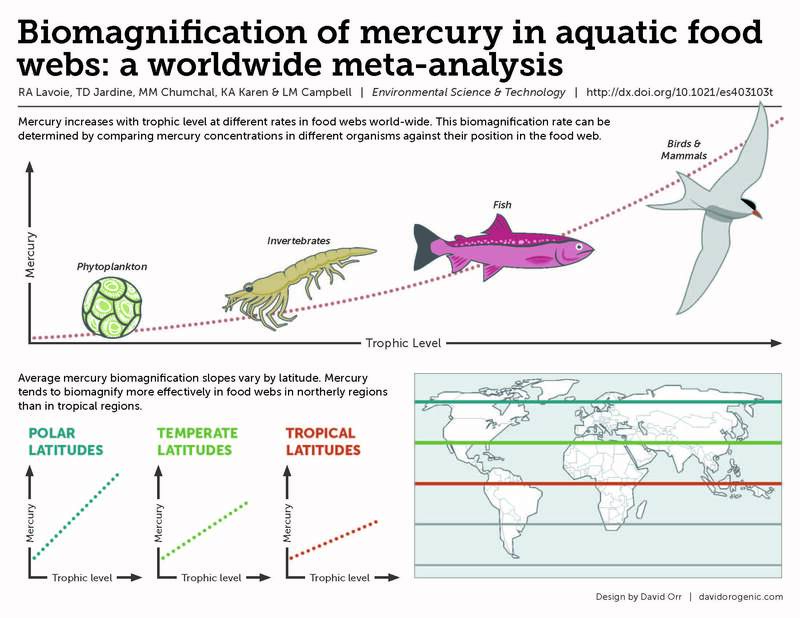 With the recent adoption of the United Nations Minamata Convention on October 10, 2013 by 139 countries to limit mercury emissions worldwide, it becomes even more important to understand variable patterns in mercury transfer through food webs. This research was supported by by NSERC Discovery Grants to LMC & KAK and an NSERC Alexander Graham Bell Scholarship, a FQRNT scholarship and an OGS scholarship to RAL. Phys.org reposting of Queen's press release: "Research shows mercury may biomagnify more effectively in northern regions" (Rosie Hales, Nov 12, 2013) Link. CBC North Midday Cafe radio interview with Raphael Lavoie on mercury biomagnification in Arctic food chains. (Leonard Linklater, Nov 15, 213). Editor's Choice, Science. 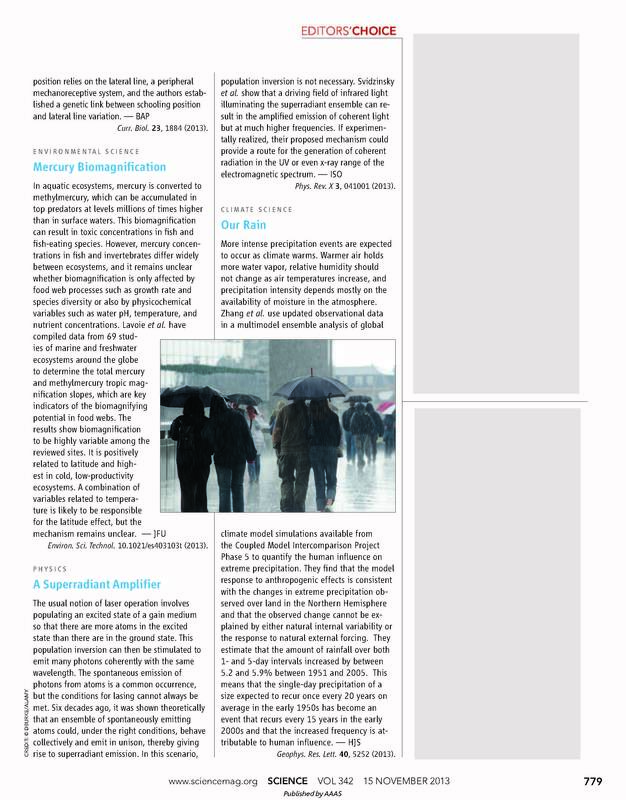 "Mercury Biomagnification" (Julia Fahrenkamp-Uppenbrink, Nov 15, 2013). Link. (institutional access or free login required). Link to jpeg of page. All images and content copyright (c) Linda Campbell and other members of Aquatic Ecosystem Laboratory.